The day before you plan to cook the chicken wings, separate them at both joints, discarding the tips. Soak the wing pieces in brine for 15 minutes, then allow them to drain in a colander without rinsing them. While the wings are draining, prepare the marinade by first juicing the lime. Wash the lemongrass, remove the root section, then dice the whitish, lower sections. Place the lemongrass pieces into a blender or food processor and add the peeled garlic cloves, the black and Cayenne peppers, the fish sauce, the stevia, and the lime juice. Grind the marinade ingredients until they form a paste or thick liquid. Place the drained chicken wings into a large bowl, and mix the marinade thoroughly in so that every piece is coated. 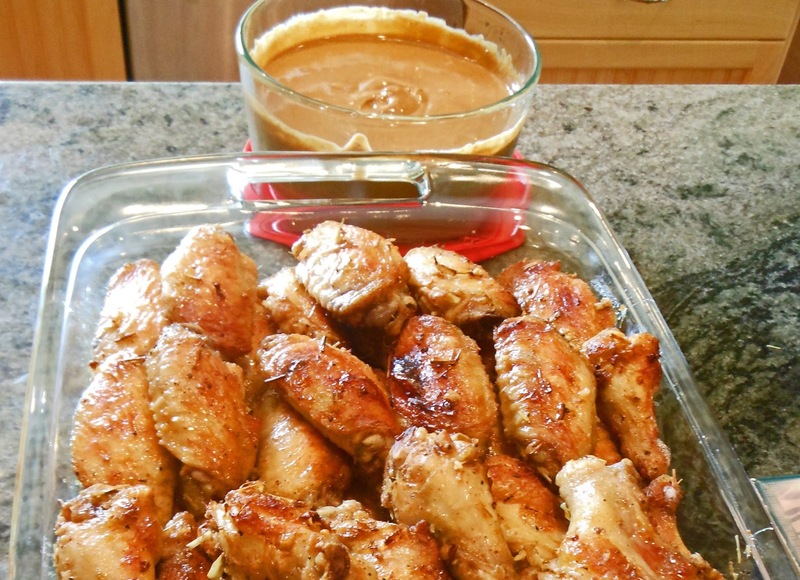 Marinate the wings in the refrigerator overnight, mixing or redistributing the marinade once or twice. About 20 minutes before cooking the wings, take them out of the refrigerator and add the olive oil, mixing it thoroughly in so that every piece is coated. Turn on the broiler, and arrange the wing pieces on a broiler pan. I like to put the drumettes on a different broiler pan from the flatter mid-sections, as they cook at slightly different speeds. Broil the wings about 15 cm (or 6 inches) below the broiler for 8 to 10 minutes on each side, then remove them from the oven. While the wings are cooking, prepare the satay sauce by combining the coconut milk, curry paste, fish sauce, tamarind concentrate, peanut butter, and paprika in a saucepan. Warm the mixture on medium-low heat, stirring and slightly mashing the ingredients together until there are no lumps (except peanuts, if you use crunchy peanut butter). Keep stirring and heating until the mixture thickens slightly and starts to look shiny. Remove the saucepan from the heat and pour the satay into a serving bowl.